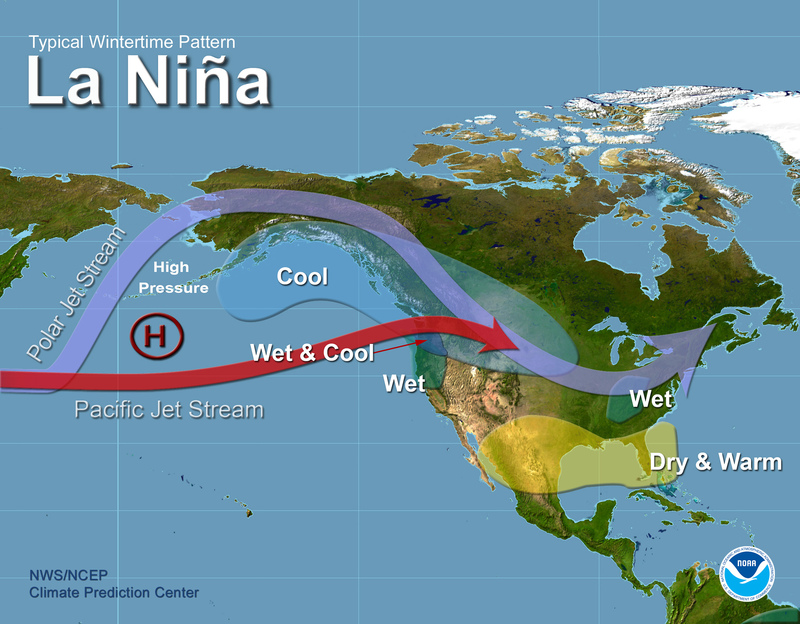 La Niña, which is Spanish for “the girl child,” is characterized by the cooling of the equatorial waters in the central Pacific Ocean, near the International Dateline. As this water mass cools down to at least 0.5° Celsius (0.9° Farhenheit) below normal, it gradually influences the atmosphere overhead and the resulting movement of weather systems around the world. Its counterpart, El Niño, which is Spanish for “the boy child,” has generally the opposite effect. A warm pool of water over the Western Pacific Ocean moves eastward to the South American coast. The exceptionally mild winter across Canada in 2015-2016 was consistent with a strong El Niño effect. This rhythmic cycle of cooler followed sometimes by warmer oceanic waters in the Pacific is not necessarily consistent year to year. In some years, there is a neutral pattern, sometimes referred to as La Nada, when sea surface temperatures stay within a ½° C (1°F) of normal. 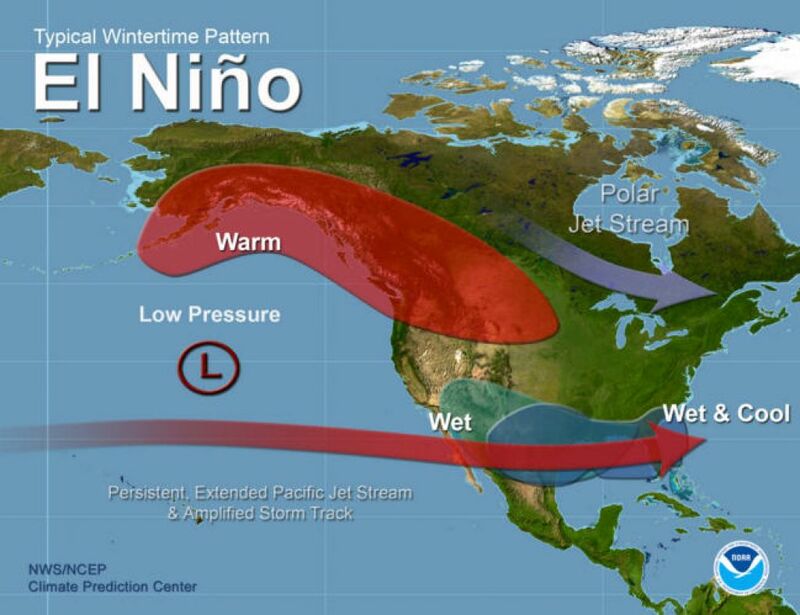 Recently scientists have determined the Super El Niño which has been in effect since March 2015 peaked in December 2015–January 2016 and all but disappeared at the end of the spring in 2016. It now appears that there is a move towards cooler waters in the central Pacific Ocean. It is at present (June 2016) too early to determine whether this cooling off phase will be weak, moderate, intense or reverse to warmer waters. The La Niña phase is generally not as strong as the El Niño phase but it often lasts longer, even as long as two or more years. Regions that saw floods or droughts with El Niño might likely see the reverse with La Niña. In the few months before the start of 2017, the atmospheric patterns will likely catch up to the cooler oceanic waters and the weather will become cooler than normal. There is always this dance between the ocean and the atmosphere; in this case, it takes a few months for the air currents overhead to adjust to the ocean water temperatures. How do these rhythms impact on gardeners and farmers? What will the weather be like in the winter and spring of 2016-2017? In Western and Central Canada, including Ontario and Quebec, people will likely experience a colder than normal 2016-2017 winter with it lasting longer into spring than the previous year. There are many factors involved in such an outlook, over and above the La Niña effect. However, it is fair to say that compared to the winter of 2015-2016, when the El Niño effect almost cancelled winter, the upcoming winter of 2016-2017 will be colder and longer, possibly resulting in a later spring due to an accumulation of more snow in most parts of Canada. Farmers may be delayed getting onto their fields in the spring as the soil may remain colder. In addition, water content of soils and the supply of water in creeks, rivers and reservoirs might be higher, and the likelihood of spring flooding might be greater. As La Niña wanes, the final fall in this cycle generally has some warmth to it, which might compensate for the previous delayed spring planting. As of August 2016, the mass of cooler air in the central Pacific Ocean is still building and it appears this cooling phase may be weak. For more information, check out the La Niña Wikipedia website, as well as El Niño Shifting to La Niña in 2016 by Gil Gullickson.